Sleep apnea is a serious, potentially lifethreatening condition that is far more common than generally understood. First described in 1965, sleep apnea is a breathing disorder characterized by brief interruptions of breathing during sleep. It owes its name to a Greek word, apnea, meaning "want of breath." There are two types of sleep apnea: central and obstructive. Central sleep apnea, which is less common, occurs when the brain fails to send the appropriate signals to the breathing muscles to initiate respirations. Obstructive sleep apnea is far more common and occurs when air cannot flow into or out of the person's nose or mouth although efforts to breathe continue. In a given night, the number of involuntary breathing pauses or "apneic events" may be as high as 20 to 30 or more per hour. 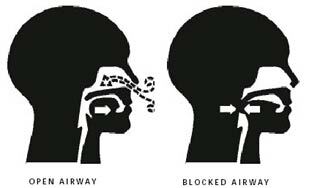 These breathing pauses are almost always accompanied by snoring between apnea episodes, although not everyone who snores has this condition. Sleep apnea can also be characterized by choking sensations. The frequent interruptions of deep, restorative sleep often lead to early morning headaches and excessive daytime sleepiness. Early recognition and treatment of sleep apnea is important because it may be associated with irregular heartbeat, high blood pressure, heart attack, and stroke. Sleep apnea occurs in all age groups and both sexes but is more common in men (it may be underdiagnosed in women) and possibly young African Americans. It has been estimated that as many as 18 million Americans have sleep apnea. Four percent of middle-aged men and 2 percent of middle- aged women have sleep apnea along with excessive daytime sleepiness. People most likely to have or develop sleep apnea include those who snore loudly and also are overweight, or have high blood pressure, or have some physical abnormality in the nose, throat, or other parts of the upper airway. Sleep apnea seems to run in some families, suggesting a possible genetic basis. Because of the serious disturbances in their normal sleep patterns, people with sleep apnea often feel very sleepy during the day and their concentration and daytime performance suffer. The consequences of sleep apnea range from annoying to life threatening. They include depression, irritability, sexual dysfunction, learning and memory difficulties, and falling asleep while at work, on the phone, or driving. It has been estimated that up to 50 percent of sleep apnea patients have high blood pressure. Although it is not known with certainty if there is a cause and effect relationship, it appears that sleep apnea contributes to high blood pressure. Risk for heart attack and stroke may also increase in those with sleep apnea. In addition, sleep apnea is sometimes implicated in sudden infant death syndrome. In addition to the primary care physician, pulmonologists, neurologists, or other physicians with specialty training in sleep disorders may be involved in making a definitive diagnosis and initiating treatment. Diagnosis of sleep apnea is not simple because there can be many different reasons for disturbed sleep. Several tests are available for evaluating a person for sleep apnea. Polysomnography is a test that records a variety of body functions during sleep, such as the electrical activity of the brain, eye movement, muscle activity, heart rate, respiratory effort, air flow, and blood oxygen levels. These tests are used both to diagnose sleep apnea and to determine its severity. The Multiple Sleep Latency Test (MSLT) measures the speed of falling asleep. In this test, patients are given several opportunities to fall asleep during the course of a day when they would normally be awake. For each opportunity, time to fall asleep is measured. People without sleep problems usually take an average of 10 to 20 minutes to fall asleep. Individuals who fall asleep in less than 5 minutes are likely to require some treatment for sleep disorders. The MSLT may be useful to measure the degree of excessive daytime sleepiness and to rule out other types of sleep disorders. Diagnostic tests usually are performed in a sleep center, but new technology may allow some sleep studies to be conducted in the patient's home. 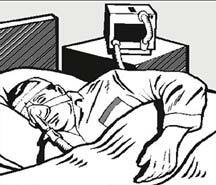 Nasal continuous positive airway pressure (CPAP) is the most common effective treatment for sleep apnea. In this procedure, the patient wears a mask over the nose during sleep, and pressure from an air blower forces air through the nasal passages. The air pressure is adjusted so that it is just enough to prevent the throat from collapsing during sleep. The pressure is constant and continuous. Nasal CPAP prevents airway closure while in use, but apnea episodes return when CPAP is stopped or used improperly. Variations of the CPAP device attempt to minimize side effects that sometimes occur, such as nasal irritation and drying, facial skin irritation, abdominal bloating, mask leaks, sore eyes, and headaches. Some versions of CPAP vary the pressure to coincide with the person's breathing pattern, and others start with low pressure, slowly increasing it to allow the person to fall asleep before the full prescribed pressure is applied. Dental appliances that reposition the lower jaw and the tongue have been helpful to some patients with mild sleep apnea or who snore but do not have apnea. Possible side effects include damage to teeth, soft tissues, and the jaw joint. A dentist or orthodontist is often the one to fit the patient with such a device. Some patients with sleep apnea may need surgery. Although several surgical procedures are used to increase the size of the airway, none of them is completely successful or without risks. More than one procedure may need to be tried before the patient realizes any benefits. Some of the more common procedures include removal of adenoids and tonsils (especially in children), nasal polyps or other growths, or other tissue in the airway and correction of structural deformities. Younger patients seem to benefit from these surgical procedures more than older patients. Uvulopalatopharyngoplasty (UPPP) is a procedure used to remove excess tissue at the back of the throat (tonsils, uvula, and part of the soft palate). The success of this technique may range from 30 to 50 percent. The long-term side effects and benefits are not known, and it is difficult to predict which patients will do well with this procedure. Laser-assisted uvulopalatoplasty (LAUP) is done to eliminate snoring but has not been shown to be effective in treating sleep apnea. Information about sleep disorders research can be obtained from the NCSDR. In addition, the NHLBI Information Center can provide you with sleep education materials as well as other publications relating to heart, lung, and blood diseases.